For a while now, I've been reading other bloggers' posts for Bread Baking Day (also known as BBD), but I've been too intimidated to join in myself. This month, I finally decided to take the leap. This is the blogging event's #24, though it is my first, and the theme is "Mixed Breads," meaning a bread that uses at least two different types of flour. This month is hosted by El Aroma de IDania. Be sure to hop over there after December 1 to see the round-up of what other bakers made this month. 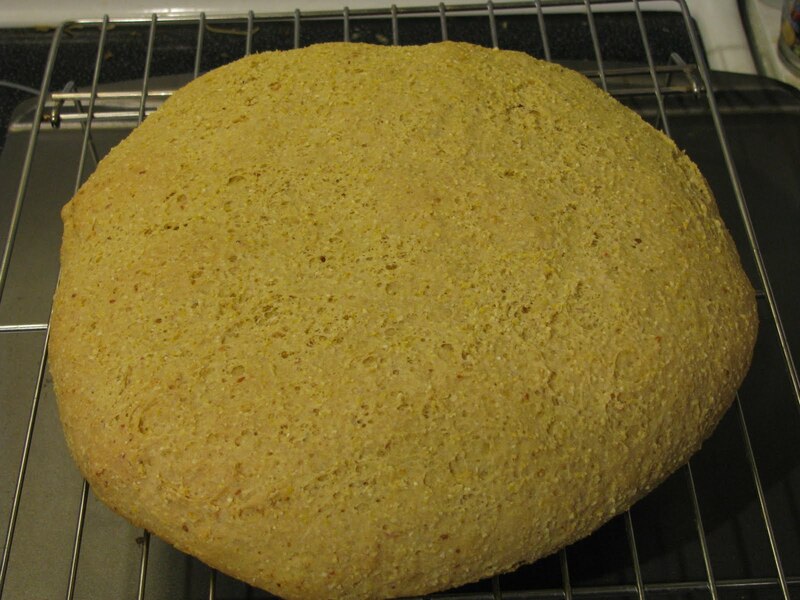 As for me, I knew I wanted to make a bread that used cornmeal and wheat flour. Mostly, I wanted to ease into this, and I knew that cornmeal was something I had worked with before. Given that the baby had taken my baking mojo for so long, I didn't want to make anything too intense, for fear that I wasn't as "back in the game" as I had thought. 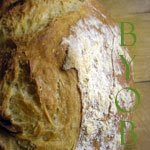 In the end, I chose the Broa, from Bernard Clayton's New Complete Book of Breads. This recipe fit the bill for me perfectly, for a few reasons. First, it was an honest-to-goodness yeast bread baking experience, so I didn't have to feel like I had shirked my responsibilities. Second, the notes on the recipe said it went well with soup, and I planned to make soup to serve to Kurt and Doug for lunch when they took a break from working on finishing our basement. And, lastly, it was an international bread that I had never tried before, which means that it stretched both my abilities and my expectations of a "corn bread" a little. The end result was good, if a little dry. Thankfully, we had the potato cauliflower soup (coming up in another post) to dunk the bread into. I'm pretty sure the bread was intended to be fairly dry and crumbly, and that it wasn't baker's error. So, I'm filing this under "soup breads" in my mind, as I couldn't really see serving it without some liquid for dunking. Pulverize the cornmeal in a blender or food processor until it is fine and powdery (I used the attachment to my stick blender). In a stand mixer bowl, combine 1 cup of the powdered cornmeal, the salt, and the boiling water. Stir until smooth. Stir in the olive oil, and cool the mixture until it is lukewarm. Blend in the yeast. Gradually add the rest of the cornmeal and 1 cup flour, stirring constantly with the flat beater of the mixer. Work the dough until it is a mass, adding 1/4 cup or more flour if necessary to overcome the stickiness. Place a length of plastic wrap tightly over the bowl, and leave at room temperature until the dough has doubled in volume, 30 minutes. Knead with dough hook for about 8 minutes, adding flour as necessary to form a firm but not stiff dough. Shape dough into round ball, place on greased baking sheet and flatten slightly. Cover the ball with wax paper (do make sure it is wax paper--my plastic wrap stuck horribly to the surface of the dough) and leave until it doubles in bulk again, about 30 minutes. Preheat the oven to 350. Bake about 40 minutes, until bottom crust sounds hollow when tapped. Cool on wire rack. Good for you for stepping out of your comfort zone. To be honest, I just recently did that with yeast myself. I thought it was the yeast that scared me when in fact it was the handling or mishandling of the dough that scared me. Good luck with the rest of your bread making! Such an interesting bread and you got some nice oven spring going on there too! I used to participate in BBD all the time but for some reason stopped and just never got back to it. Now you've got to thinking about entering again..LOL! Thanx for participating in this event.